Of the 34 eateries that made the list, 17 can be found in traditional food centres. Singapore’s most iconic local dishes such as laksa, Hainanese chicken rice, bak kut teh and even the humble curry puff took the spotlight among the list of Bib Gourmand awardees in the 2016 Michelin Guide Singapore released by Michelin this morning. 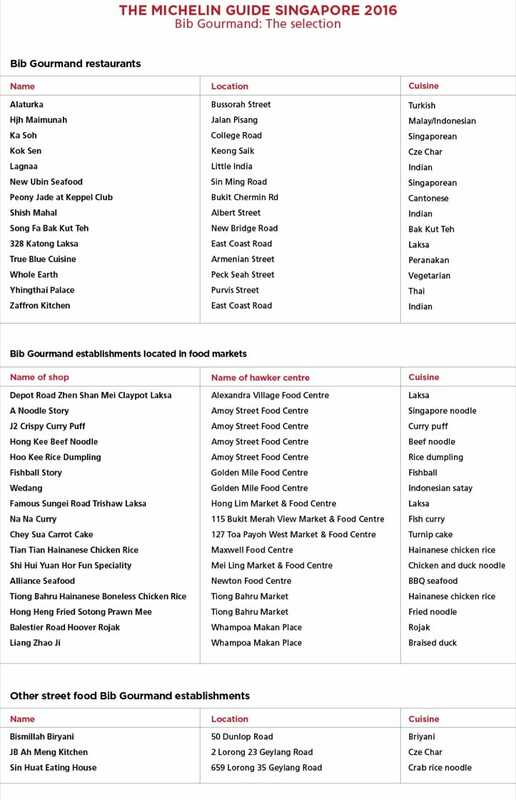 Of the total of 34 eateries that received the Bib Gourmand rating - which is usually announced by Michelin a few days before the full guidebook launch - 17 are found in traditional food centres while 14 are restaurants and 3 came under the 'other street food establishments' category. 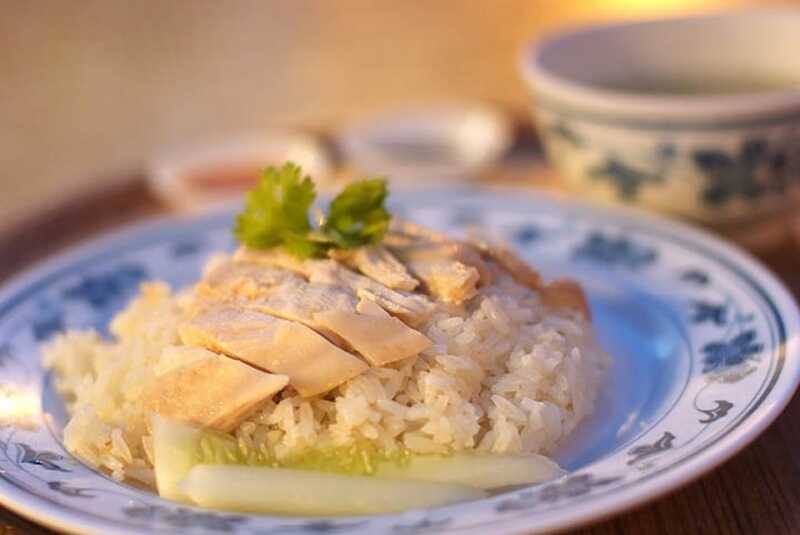 To qualify for the rating, venues must offer a good value meal for under S$45. The Singapore Bib Gourmand awardees this year represent over 19 cuisine types, including Indian, Cantonese, Vietnamese and even Turkish food, testament to the rich diversity of Singapore’s culinary landscape, says Michael Ellis, the International Director of the Michelin Guides. “A true crossroads, a mix of cultures with Chinese, Malaysian and Indonesian influences, Singapore’s history is reflected in its cuisine - the variety, simplicity and authenticity completely won over our inspectors,” he added. Among the hawker options are a multi-cultural span of popular favourites such as Tiong Bahru Hainanese Chicken Rice in Tiong Bahru Market, J2 Crispy Curry Puff in Amoy Street Market, Wedang Indonesian satay in Golden Mile Complex and Bismillah Biryani on Dunlop Street, and even newer names such as A Noodle Story started in 2013 by two fine dining-trained hawker-preneurs. Cze char eateries, a characteristically Singaporean variety of casual Chinese restaurants offering home-style cooking, also received a nod from the Bib Gourmand list, which named long-celebrated food haunts such as New Ubin Seafood, JB Ah Meng and Sin Huat Eating House in Geylang, the latter famed for its crab beehoon. Restaurant options among the Bib Gourmand venues include recognisable brand names such as Peranakan restaurant True Blue on Armenian Street, 328 Katong Laksa, and Song Fa Bak Kut Teh, which started peddling its Teochew-style pork rib soup from a humble pushcart along Johor Road in 1969 and now has six outlets in air-conditioned malls and heritage shophouses islandwide, and a tech-savvy second generation at its helm. *Note: Wedang has since moved to Aljunied and Fishball Story to Timbre+ in One-North. Addresses were accurate at the time of assessment. Can't wait for the full 2016 Michelin Guide Singapore results? Remember to bookmark this page or follow us on Facebook for the full reveal of the Singapore's first Michelin guidebook edition on July 21! Chef-Owner Rishi Naleendra will open a casual bistro in Cheek By Jowl's existing space by March and a new modern Australian fine-dining restaurant by mid this year. We check out 6 recently-opened fast-casual eateries by chefs and restaurant industry veterans that are bang for your buck.